PMA is pleased to highlight Aaron Wiegel, president, Wiegel Tool Works, Wood Dale, IL. For more than 75 years, Wiegel Tool Works has been a go-to metal stamping source for engineering-driven programs. The company serves the aerospace, appliance, automotive, construction and housing, electronics, lighting, military, solar and telecom industries. Read Aaron's thoughts about game-changing metalforming technology, what is on his wish list for his shop, and more! A: Being a member of the PMA is crucial for our overall business at Wiegel Tool Works (WTW). 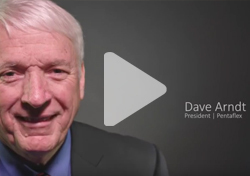 The value-added networking, member services, and government engagement offered is crucial for not only WTW, but for the entire manufacturing industry. 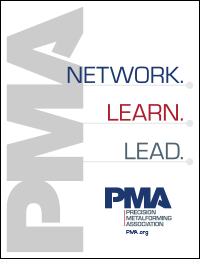 I embrace the PMA networking group that I have had the privilege of being involved in for over three years as I truly value the relationships I’ve made. Additionally, WTW often engages in many of the seminars organized by the PMA. I place a great value on the government relations offered through the PMA as I believe it is critical that we stay in front of our local and federal elected officials. These officials play a huge role in the success of manufacturing and we need a unified voice in order to tell them manufacturing’s message. A: Wiegel Tool Works plans on growing its business by adding additional manufacturing capabilities along with expanding internationally. There has always been a lot of pressure in the global marketplace to be able to produce local content. WTW has always explored this option and hopes to make that a reality in 2017. A: The game changer we see is the servo press technology in presses. For decades, the technology for presses never changed. Oftentimes, you had to spec out your machines with a set stroke length, which did not provide companies with a lot of versatility. Link motion came on the scene in the 2000s, which moved the needle for presses, but was not a game changer. From what we’ve seen so far, the servo technology is exactly what we needed. It allows manufacturers a lot more options when programming dies to specific applications. Now that the servo technology has been proven and strokes per minute have improved, we see this as an important investment. A: • The ideal agenda for a metalforming conference is to continue to push the message of manufacturing to the next generation. We feel that a crisis is looming in our current workforce. As the baby boom generation retires off and less millennials enter the manufacturing workforce in the United States, it is a growing concern for Wiegel Tool Works and for the industry as a whole. We feel it is such a grave, long-term problem for our industry that it is up to the leaders of our industry to develop a strategic plan to fill this skills gap. A: My dad once told me “you cannot manage what you cannot measure.” This is obvious in our industry as we measure everything we can in order to get a good pulse on the overall health of our companies.